Video: The Legendary Lights of Clifton Mill will be featured on ABC's "The Great Christmas Light Fight" Monday, December 3. The Legendary Lights of Clifton Mill, a Christmas Holiday tradition for over three decades is highlighted on ABC TV’S ‘THE GREAT CHRISTMAS LIGHT FIGHT’ Monday evening, December 3, 8-10pm broadcast locally in Dayton on WKEF-ABC22, WCPO Ch. 9 in Cincinnati, WSYX Ch. 6 in Columbus, and all over the country on the ABC Television Network. Scroll down to watch the trailer. “We couldn’t be more excited that ABC picked us to be featured on their show.’ Said Anthony Satariano, co-owner of Clifton Mill. “Folks around here know about the Legendary Lights of Clifton Mill, now we have this opportunity to share the fun, excitement and wonder with the entire nation.” Said Jessica Noes, General Manager of Clifton Mill. The Legendary Lights of Clifton Mill will ‘turn on’ for the holiday season Friday, November 23, always the day after Thanksgiving. We are honored Ohio Attorney General and Ohio Governor Elect Mike DeWine will flip the switch for our 31st year. Gates open at 5pm, and precisely at 6pm, over 4 million lights brighten the night instantly, transforming the mill and gorge into a shimmering world of Christmas wonder. We are open 7 nights a week through December 31. What began as a simple idea of stringing a few strands of lights on the historic mill for the enjoyment of family and friends is now one of the largest outdoor holiday displays in the country. Now, millions of lights later, the Legendary Lights of Clifton Mill decorate the mill, trees, river banks and almost everything in between. Including the water wheel. One of the big crowd pleasers is the covered bridge synchronized light & music show, which occurs hourly each night. Also 31 years ago, the owners began work on a miniature village with scaled down versions of some of Clifton’s historic buildings built by an artisan in Pennsylvania. There have been new additions each year by a variety of artists and today it is a sight to behold with street after miniature street of scaled-down homes and businesses, a tiny Fire Dept. putting out a “house fire”, an outdoor train, a 1950s drive-in theatre, a County Fair and much more lit up for the holidays! 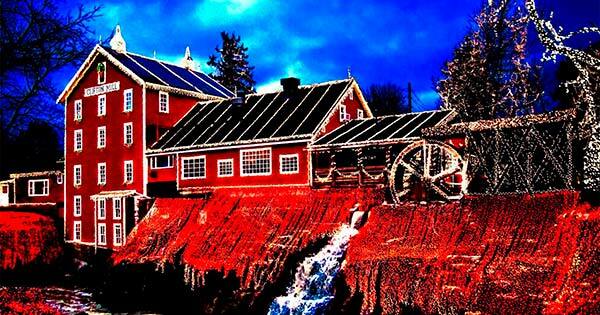 Clifton Mill has over 3000 examples of ‘Santa Claus’ on display dating back to 1850. Some are toys, some used for advertising, odd to elegant, all are interesting. Plus, a real live Santa popping out of the chimney.